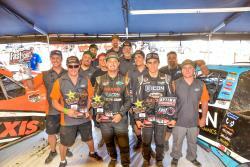 The JM2 Motorsports team headed south of the border to Estero Beach, not to relax, but to overcome any challenges that would be thrown that at them from a track on the beach. 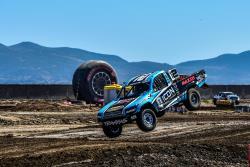 The Lucas Oil Off Road Racing Series rounds three and four were held in Ensenada, Mexico, next to the Estero Beach Resort. 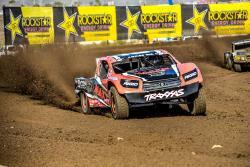 Jeremy McGrath and Brock Heger were both able to handle everything that was thrown at them and finish strong. 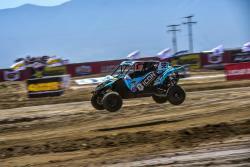 Brock started out the weekend up front in his AIRAID Filters Production UTV where he would battle in the front both days. Each race, Brock would battle for the lead throughout both races, just missing the win and finishing in second both days. After finishing strong both days over the weekend, Brock would over take the lead in the championship points. Brock wasn’t the only one standing on the podium in Mexico. Jeremy had a very strong weekend in his Maxxis Tires, AIRAID Pro2 as well. It all started in qualifying and then carried it into the race. For Saturday’s race, Jeremy started on the front row and with the green flag he would jump out into the lead and stay there until the checkered flag waved, giving him a first place podium finish. 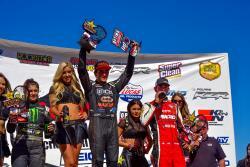 On Sunday, Jeremy was fast once again, qualifying number one for the race, but drew an inversion of six. Starting on the third row Jeremy knew he had a hard race ahead of him. With all the sand and dirt flying into the truck from the roost in front of him, the AIRAID filters were going to be put to the test. The filters held up strong, keeping everything out of his motor, but other parts on the truck weren’t so fortunate during the race. Jeremy said, “Starting from the 6th position is hard to come back from at any race, but Mexico is the hardest. The roost was insane and I did my best to charge to the front. I had some heavy contact in turn three that left me with a bent tie rod. The truck was difficult to keep straight and a 5th was the best we could do today. 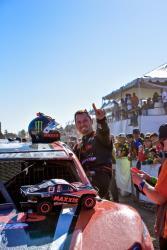 My team did an amazing job, it was great to have my family here and the people in Baja are so welcoming! We sure do love Mexico and the win on Saturday felt great!” With Jeremy’s win and a fifth place finish, he is second in points in his Pro2. Mexico was both a strong weekend and a strong start to the 2017 season for the JM2 Motorsports team. They will be heading out to rounds five and six at the Utah Motorsports Complex in Tooele, Utah, in June. So watch for Brock and Jeremy to be up in front and battling for the win every time they are out on the track.